An increasingly important actor on India’s urban scene could help the country reach its ambitious goal of 40 gigawatts (GW) of rooftop solar power capacity by 2022. Meet the urban electricity “prosumer,” a consumer of electricity who also produces it and can sell it back to the grid, often through a rooftop solar photovoltaic (PV) system. For major cities in developing countries, the prosumer could be an essential ingredient in meeting the growing need for electricity. The use of rooftop solar PV systems is catching on with prosumers, thanks to improved performance of rooftop solar panels, more consumer choices, lower costs and available subsidies. Increasing retail electricity tariffs and unreliable supply have been other drivers as households look for alternative electricity sources. By late 2014, an estimated 30 percent of the global cumulative installed capacity of PV was owned by residential entities. Today, in the United States alone, more than 600,000 homes and businesses have on site-solar. And the boom in U.S. residential solar isn’t set to slow down: UNEP estimates that the number of residential customers with solar PV is predicted to more than double by 2020, with an average of 1.7 GW added capacity annually. In India, renewable energy is expected to play an essential role in generating added electricity capacity, according to the Ministry of Power’s recent Tariff Policy, which makes the promotion of renewable electricity one of its primary objectives. The policy endorses the idea of prosumers as a way to spur growth in renewables, particularly rooftop solar PV systems, encouraging state governments to support solar-friendly policies. By October 2015, the country had a total installed rooftop solar PV capacity of 525 MW. However, this means that reaching India’s national solar rooftop target of 40GW by 2022 will require increasing current capacity 76 times by that date. Many Indian states, like Karnataka, already have policies that support rooftop solar PV systems. Karnataka’s capital city Bengaluru, like many large cities in developing countries, is struggling to meet its energy needs. In September 2015, the city’s utility, BESCOM, failed to meet the needs of its 8.9 million customers by falling 900 MW short of meeting its 3,400 MW peak demand. Part of Bengaluru’s struggle to meet demand is due to increasing pressures of water scarcity and droughts on the city’s highly dependent hydro power plants. To alleviate pressure and meet energy demand, major cities like Bengaluru are exploring ways to increase prosumer adoption of rooftop solar PV through net-metering, a policy that gives consumers financial incentives to generate electricity for the grid by paying prosumers 9.56 rupees per kilowatt hour (kWh) (equivalent to $0.14 per kWh) for surplus electricity produced. As of May 2016, this rate changed considerably to 7.08 rupees/kWh for systems smaller than 10kW, and significantly lowers the amount prosumers would receive for surplus electricity. Since Bengaluru introduced the net-metering program in 2014, more than 5.6 MW of rooftop solar panels have been installed by residents, business owners, schools and other public institutions, and have been connected to BESCOM’s grid. But the program will need to accelerate quickly for the state of Karnataka to meet its solar goal of 400 MW of grid-connected rooftop systems by 2018. 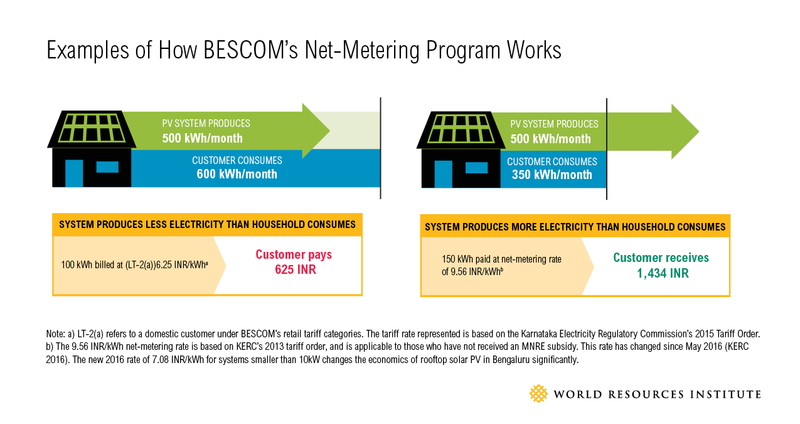 To better understand the current barriers to Bengaluru’s net-metering program, WRI published a working paper, Prosumers in Bengaluru: Lessons and Barriers for Scaling Rooftop Solar, which identifies obstacles, including a lack of understanding of rooftop solar PV performance, cost and payback by potential prosumers and confusion over the details of the net-metering program. Find out more about what cities can do to meet electricity demands by tapping into the prosumer movement.